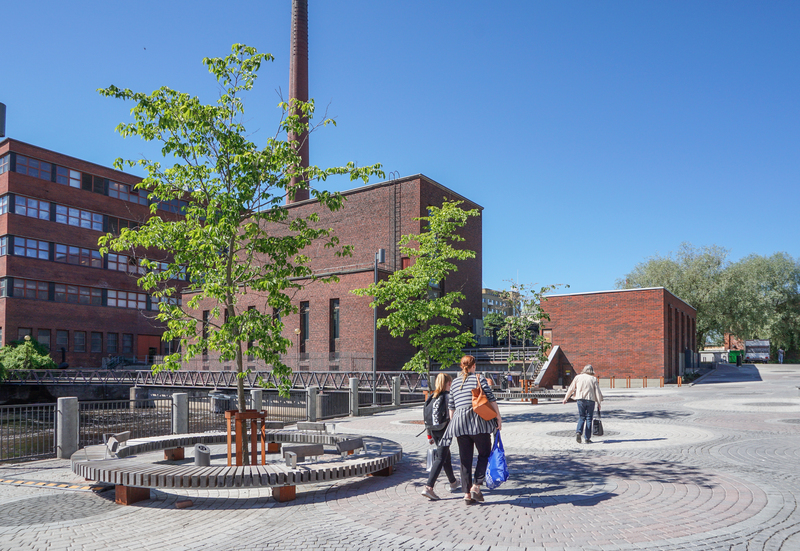 In Tampere (FI), traces of the city’s industrial past are visible everywhere. There may be no other place where Rough&Ready Circular Benches blend so well with their surroundings as they do here. The circular patterns, substantial beams and robust CorTen steel frames are perfectly at home in this unique setting. Nestled in a slightly hilly area and surrounded by water, Finland’s third city is situated on a strip of land wedged between two large lakes that are connected by the Tammerkoski river. The former 18-metre-high waterfalls on the river that runs straight through the city centre have been tamed by dams and hydropower plants. The force of the rushing water has helped to make Tampere an important industrial hub and the largest inland city in Scandinavia. The city’s industrial past stretches along the banks of the Tammerkoski. Tampere was built on the textile industry and rapidly grew to become the ‘Manchester of the north’ by the end of the 19th century. The three power plants in the heart of the city, all still in operation, form the backdrop for cosy outdoor eateries and thoughtfully designed public spaces. 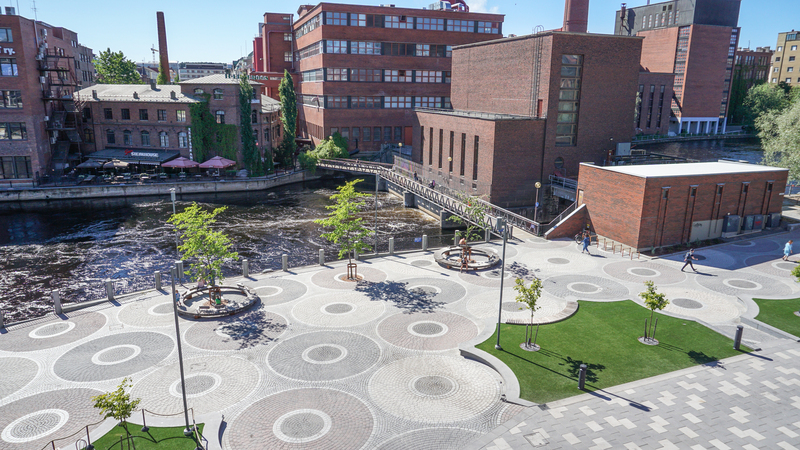 In 2014, the city authority organised a competition for the redesign of Vuolteentori, the old market square adjacent to the river. A continuation of one of the city parks, the square is located between two pedestrian bridges that traverse the river. It’s a busy place that plays host to pavement cafés and is part of an important walking and cycling route through the city centre. Näkymä Landscape Architects from Helsinki came up with the winning design. Näkymä drew inspiration from the city’s textile heritage. 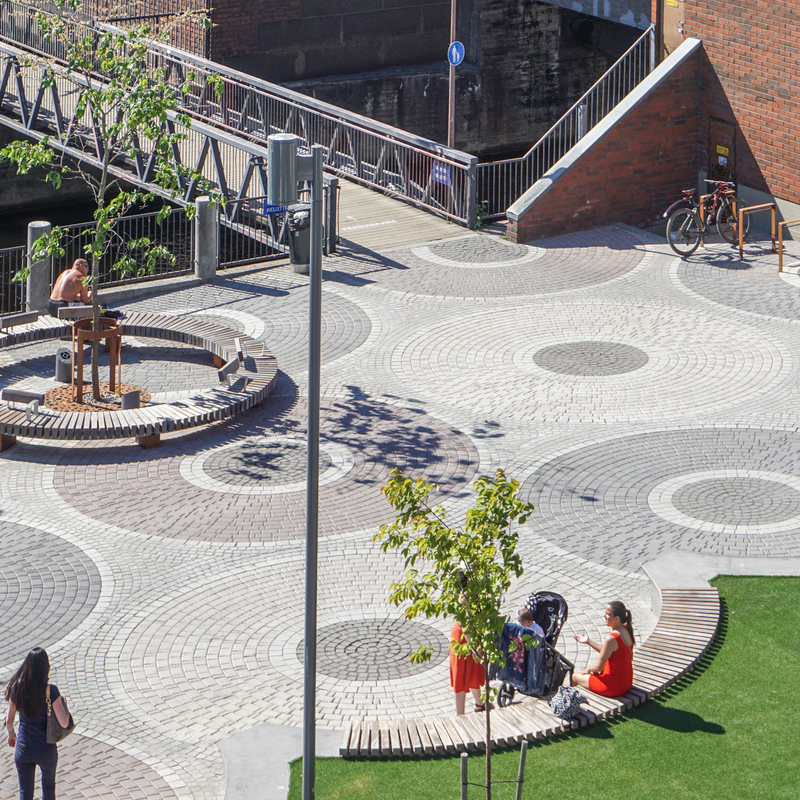 Circular patterns (representing textile bobbins) have been incorporated in the paving, which is bordered on one side by the quay and on the other by low retaining walls which hug the outlines of the ‘bobbins’. These curved walls absorb a difference in height and partition the square from the outdoor cafés that extend to the edge. Rough & Ready (R&R) Circular Benches blend seamlessly with the design. 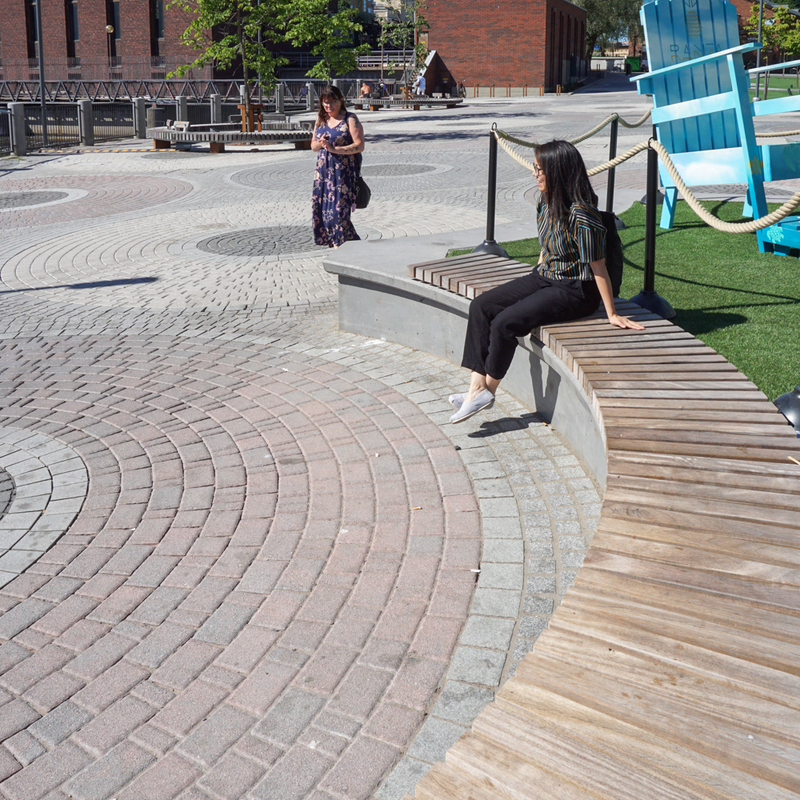 The benches form a second layer of circles with the same diameter as the ‘bobbins’ and ‘float’ above the paving. The substantial beam size and the CorTen steel supports are in complete harmony with the overall industrial theme. Solid Curved Top Seats have been placed on the retaining walls. Due to strong product coherence within the Streetlife collection, it is easy to combine street furniture from the R&R series with items from the Solid series. 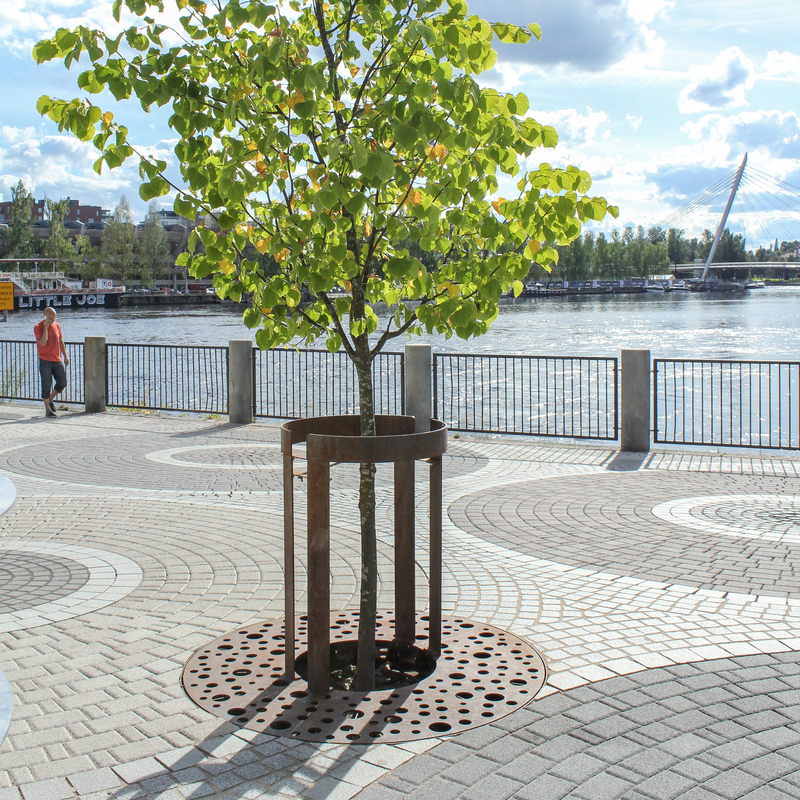 CorTen Tree Guards and Grilles based on Streetlife’s Casual Dots pattern protect the trees in the square. Two different tree grille designs have been used to create a perfect balance: round grilles on the lower level match the bobbins-based design of the paving, while square grilles blend with the rectangular floor shapes on the raised level where the cafes are situated. CorTen Bicycle Racks complete the picture.